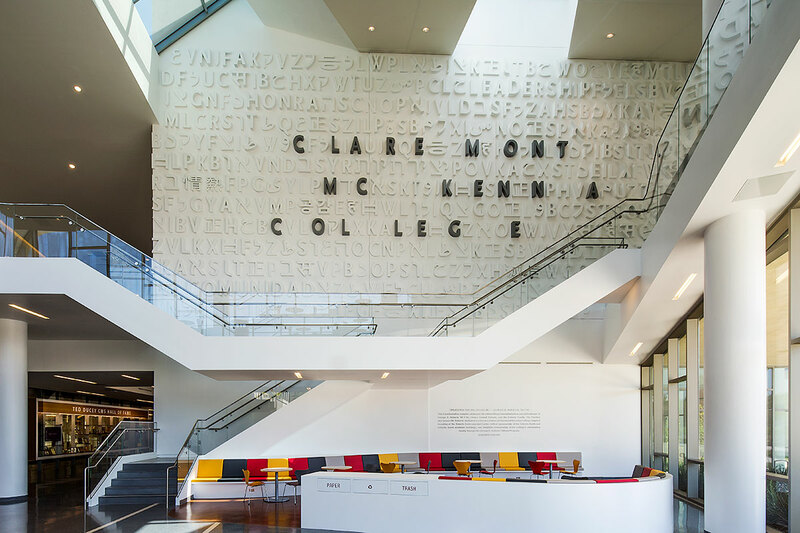 All big design and construction jobs are done by crunching the numbers, but the character wall that greets visitors in the main foyer of Claremont McKenna College's new fitness and events center, Roberts Pavilion, was literally done by the letters. The two-story wall, designed by the award-winning design firm John Friedman Alice Kimm Architects (JFAK), is the first thing visitors notice upon entering Roberts Pavilion, and what immediately jumps out is a quote emblazoned on it from Roberts Pavilion benefactor, CMC trustee and alumnus George R. Roberts '66 P'93: “Whatever you do, go all in.” That sentiment certainly encapsulates the depth and variety of what the facility has to offer CMCers. The wall is 78 feet wide by 27 feet high. The characters, which have an average weight of two pounds, are aluminum which was the lightest material that would also provide necessary stiffness and durability. The faces of the 18-inch tall characters were initially cut from 1/8 inch thick aluminum. The sides of the letters vary in thickness from 1 to 6 inches. The letters were welded to brackets attached to the structure and the edges were ground smooth and sharp. Along with the quote, the wall features a jumble of letters that form an enormous word map. The letters and characters from 10 languages underscore CMC’s global reach and outlook and the words describe the virtues and verities that the College embodies. Bringing the wall to fruition was a collaborative effort of creative give-and-take that included President Chodosh, designers at JFAK, members of the CMC faculty who were polled about which languages to include, and a design committee. Linguists also assisted in coming up with analog words spelled out in the 10 most-spoken languages at CMC. They are: community (Spanish), leadership (English), integrity (Chinese), empathy (Korean), responsibility (Arabic), excellence (French), courage (Hindi), creativity (Hebrew), honor (Portuguese) and passion (Japanese). JFAK was hired to design Roberts Pavilion after winning a competition in the summer of 2008. The firm was not as big as the other firms competing, but JFAK had been noticed for its innovative work at Caltech. JFAK worked on the design of Roberts Pavilion through most of 2008-2009. After a brief respite, work started again in 2012. The character wall was designed after construction had started on the project, in 2013. Friedman generated the initial design ideas for the wall and then worked closely with Todd Spangler and Shuang Xu at JFAK to work out its details and create the renderings. Friedman then worked with the College to implement additional ideas. Melissa Schild, Assistant Vice President of Facilities and Campus Services at CMC, was also integrally involved to make sure everything was done correctly. On the construction side, JFAK's team of Claudia Kessner (project architect), Derek Greene, Todd Spangler and Shuang Xu worked closely with Schild, Michael Sutton '76 (then CMS Director of Athletics) and Frank Perri (then CMC’s Director of Construction), the contractors PCL, and the fabricators to bring the design to reality. “We always endeavor to create dynamic forms and spaces with interiors filled with natural light,” Friedman says. “We aspire to create joyful spaces that people love to be in and want to use for a variety of purposes, even if they don’t really realize why. According to Friedman, often during installations similar to the Roberts wall, an artist will take the lead with an architect responsible for executing the project, but not in this case.